When you perform repetitive, overhead movements, it is possible to develop biceps tendinitis that will cause severe shoulder pain. The condition takes some time to develop and usually hurts the front of the shoulder first. The pain becomes severe with continued activity. Your physical therapist will first assess your shoulder to identify the exact source of the pain and then recommend a program of stretching, activity modification, and strengthening. 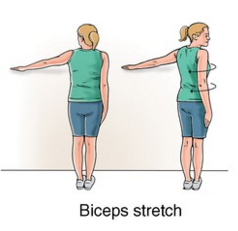 They will help you learn about biceps tendonitis exercise to relieve pain and soreness. What Cause Your Biceps Tendonitis? So many factors combine to make you deal with biceps tendinopathy. It does not occur in isolation in most cases and is usually the outcome of tendon impingement, overuse, and shoulder joint trauma. It coexists with other shoulder conditions, including rotator cuff tears, rotator cuff impingement syndrome, SLAP lesions, labral tears, and shoulder instability. You are more likely to deal with this condition if you are a swimmer or gymnast – participating in contact sports may also lead to the development of biceps tendonitis. Several factors increase your risk of developing this condition. The most common are muscle tightness, joint stiffness, inadequate recovery periods from sporting activity, and inappropriate training. Excessive training, poor posture, muscle weakness, shoulder instability, abnormal biomechanics, and a history of shoulder injury make you more susceptible to developing biceps tendonitis. What Exercises Can You Do to Relieve Biceps Tendonitis? A biceps tendonitis exercise will help improve mobility and alleviate pain as well. There are many different exercises for you to try, but be sure to talk to your doctor first and avoid overhead lifting while recovering. 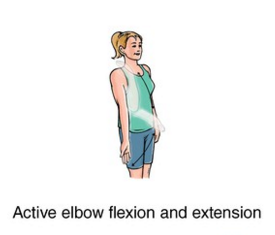 Bring the palm of the hand on your injured side up close to your shoulder and bend your elbow at the same time. Now, straighten your elbow slowly. Do the same 15 times. With your face towards the wall and your feet 6 inches away from it, slowly lift your injured arm and take it to your side. Keep your arm straight while placing the thumb side of your hand against the wall. Now, rotate your body in the opposite direction of your raised arm. Hold for 15 seconds when you feel a light stretch. Repeat thrice. For this biceps tendonitis exercise, grab a 5-pound weight in your hand and curl your hand while bending at your elbow only. Hold the position for 5 seconds and return to the starting position. Do 2 sets of 8 reps. Stand in an upright position with your injured arm hanging down at your side. Slowly lift your arm up toward the ceiling while keeping it straight all the time. Hold it when it is straight towards the ceiling. Move back to the starting position after 5 seconds. Stand in an upright position close to a door. 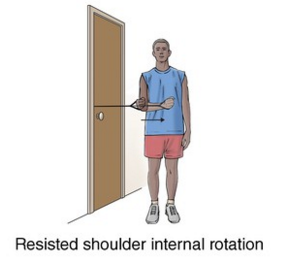 Be in a sideway position with your injured arm very close to the door. Take a tube and tie it in the door at your waist level. Grab the other end of the tubing with your injured arm and slowly bend your elbow at 90 degrees. Rotate your forearm while keeping your elbow in. Move back to the starting position and repeat twice. For this biceps tendonitis exercise, you shouldlie on the floor on your uninjured side. 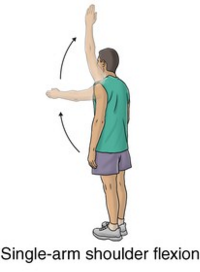 While keeping your injured arm at your side with your elbow bent 90 degrees, slowly raise your forearm towards the ceiling. Hold the position for a couple of seconds when you feel a stretch. Repeat twice with 15 reps per set. For this exercise, you should lie on the floor with your knees and hips flexed and your arm straight out in front of your body. Remember, you have to be on your injured side and bend the elbow on this side to a 90-degree angle. Make sure your fingers are pointing up all the time. With another hand, push your injured arm down towards the floor. Squeeze your shoulder blades a little and hold for 30 seconds. Repeat thrice. You will work with an occupational therapist who will help you understand how to use adaptive equipment. They will also help with ergonomic modifications, simplification strategies, and proper stretching of the shoulder girdle musculature. You may consider taking an injection with corticosteroid and anesthetic into the biceps tendon sheath to relieve pain. Your doctor may consider performing the procedure under ultrasonography’s guidance to ensure the medication is delivered to the right area. This often helps provide some pain relief. If you have your shoulder taped specifically, you may have to sleep in an upright position. Talk to your physiotherapist about it. Using icepacks will help relieve pain and reduce swelling as well. Make sure to apply an icepack for no more than half an hour in one session. Use it every couple of hours for pain relief. How Can You Prevent This Kind of Injury? A biceps tendonitis exercise really helps strengthen your shoulders and biceps, but you should also take some preventive measures to avoid sustaining an injury in the first place. Avoid repetitive overhead movements as much as you can. Maintain a good posture. You may injure your neck, shoulder, and back if you do not maintain a good posture all the time. Talk to your physical therapist to know how to maintain a right posture considering your work environment. Never lift heavy objects away from your body. 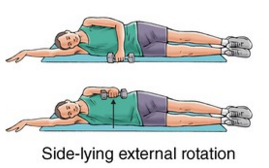 Always perform some rotator-cuff strengthening exercises to avoid injuries.